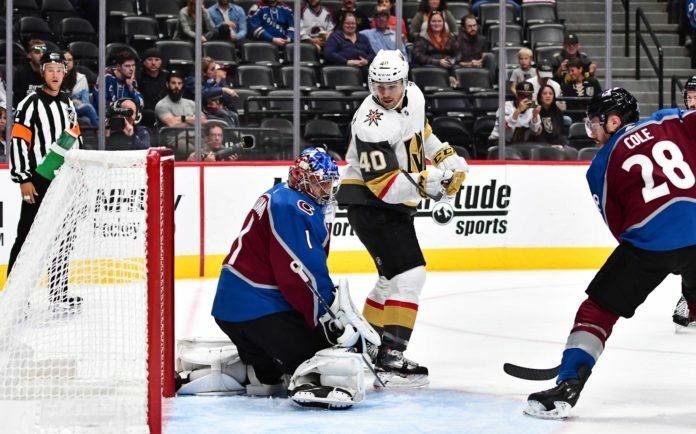 The Colorado Avalanche kicked off their 2018 preseason schedule with a home defeat at the hands of the Vegas Golden Knights. 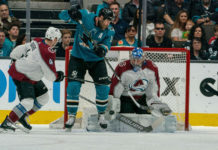 A sloppy start to the game led to an early deficit, and the Avs were not able to create a whole lot of offense on the evening, losing 5-1 to Vegas. Mikko Rantanen, like the rest of the top line, was not able to make an impact on the score sheet, but you got a glimpse into what Rantanen worked on over the summer. The gigantic winger looked quicker and more agile with the puck on his stick. Given his size and strength, the addition of more speed for Rantanen could lead to nightmares for opposing defenses this season. Semyon Varlamov got his first game action since his 2017-18 season ended with a knee injury, and he’ll need a few more games to get ready for the regular season. The first goal that got by him was not a great shot, as it was along the ice and from a poor angle. The other two were goals were not really on him, but you will have to imagine he’ll get at least one more full game before the regular season starts. Mason Geertsen, entering his fourth year of professional hockey, had a nightmare of a game. He struggled with the puck on his stick all night, and took two undisciplined penalties, both of which ended with goals by Vegas. It’s just pre-season, but he had the worst possession numbers on the team, as the Avs controlled only 20% of the shot attempts with him on the ice. Seeing as how he’s on his second contract with the Avalanche, you would have hoped to see a more developed player by now. 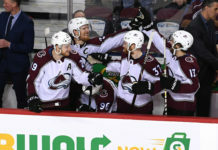 Ryan Graves was acquired by the Avs at the trade deadline in February to little fan fare, but he was the most impressive defenseman on the ice for the team on Tuesday night. He led the team in possession numbers, controlling nearly 55% of the shot attempts on the evening, and scored the lone goal. The 23 year old fell out of favor in the Rangers system and maybe a change of scenery will lead to more success. The Avs are certainly hoping so. Avs fans got their first look at newcomers Ian Cole and Matt Calvert. Of the two, Calvert had the more impressive debut, creating a few chances with his speed and tenacity, while Cole had some tough moments with the puck and got caught a little high on the third goal for Vegas. They’re both clear locks to be playing opening night, and are expected to improve the team this year, especially on the penalty kill. Like most of the veterans that played tonight, it’s important not to take too much from this game, as they’re trying to gear up for opening night. The Avs next preseason game is Saturday evening, when they head to Minnesota to take on the Wild. The game starts at 4 PM MST.